Oh Sundays - for some it means a day with no obligations. A day where you wake up from the fun events of Friday night and Saturday - take the day to relax before starting your week back. A day that is easy and free. This “easy like Sunday morning” idea is the theme of the 1977 classic hit “Easy” by the Commodores. Good ol’ Lionel Richie sang about breaking up a relationship with a controlling woman and becoming “easy like Sunday morning” free from anything that may gives him stress, rules or restrictions. Picture him waking up after a fun weekend on Sunday morning around noon (because thats what time you get to sleep in when you are “free”) having a cup of HOT coffee, reading the paper, heading out for brunch, and laying around the rest of the day catching up on tv or just relaxing - you know an “EASY” day. But one thing that Lionel didn't think about when writing this song is the version of “Sunday mornings” we parents have, especially the southern mamas and daddy who are doing their best to get themselves and their little ones to church on Sundays. So sit down Mr. Richie and let me tell you a little bit about how Sunday mornings are FAR from easy around here at the Watts household. His scheme usually starts at bedtime around 7:30 on Saturday nights, when my husband calls and says “Honey Im sorry it will be a late night” and I realize Im alone to conquer that awesome bedtime routine all by myself once again. After fights, screaming, tears, lots of bargaining with fruit snacks and juice after everyone has already brushed their teeth, I get the kids down for bed - and then go back up 5 minutes later to make them go to bed again and then 10 minutes later I go back up yet again. The goal of a 7:30 bedtime on Saturday nights so they can have a good nights rest before Sunday is usually squashed around 8:30/9:00 when they finally pass out after screams and cries about not being able to stay awake “just one more minute” to wait on daddy. I finally come downstairs to start cleaning up and realize I forgot to get their church clothes down so I could have them all ironed and ready for an “easy” Sunday morning. I usually set an alarm on my phone at this point for 30 minutes earlier than i usually wake up so I can have the extra time to iron the clothes that I forgot to get down but forget to actually turn it on so it never works (true story - I always forget). I stay up way too late waiting up for my husband to get home from work, cleaning up a mess so I don't have to wake up to a dirty house, packing the diaper bag, sippy cups, nursery bag or doing just “one more load” of laundry that usually ends up being 2 or 3 more loads. I go to bed WAY too late which causes me to wake up WAY past the time Im supposed to the next morning. Yes, thats the way the devil works - he keeps you up thinking that if you have everything nice clean and tidy the night before you will have an “easy morning” but really you spend too much time doing pointless things that will all be “undone” 5 minutes after the kids wake up the next morning and wake up WAY too late which causes more chaos and gives that ol’ devil a chance to keep you out of church that Sunday morning. Yes, I know his tricks - sometimes I give in to them thinking that this time will be different and sometimes Im smarter - but most of the time I give in to the struggle and before its too late I realize he won that Saturday night battle - But the best news of all, is that Satan may win a battle here and there but I know who always wins the war - our precious savior Jesus Christ - and although the struggle on Sundays is always more real than any other day - I will always keep pushing to get to our family to church that morning. I will never let the devil win the war! Let me tell you a story about Easter Sunday. Now every Sunday, the devils works hard to get us OUT of church instead of staying IN church. - but he worked EXTRA hard on Easter Sunday. Just like I stated earlier, the Saturday night before church was a typical chaotic night. We decided to let the kids open their easter baskets the night before since we knew I would be alone with the kids easter morning while Mitchell served early at church but >crazy us< didn't remember that chocolate and bedtime DO NOT go very well together. Bedtime ended up way behind the time it was supposed to be and we all stayed up way too late. Mitchell had to be at church early that Sunday morning which meant I got the privilege of getting the kids all dressed in their VERY Sunday best. 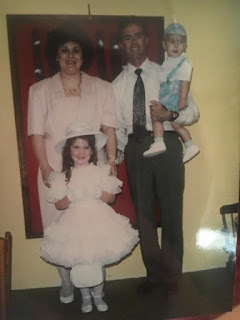 It was Easter Sunday and because we are in the south, that means every hair is curled and every tag is popped off of those new easter clothes you searched for weeks and weeks to wear for today only. The kids screamed for candy for breakfast, I warmed up my coffee 5 times (I kept tally on the chalkboard beside the coffee maker! ), no one wanted to come downstairs and once I finally got everyone down, the kids acted like I was injuring them while trying to get them dressed. My hair and makeup that I had gotten up early to do 3 hours before anyone else was awake was now the true definition of “a hot mess”. My hair was now as flat as pancake and my makeup had been washed off by all the sweat I had produced while battling 3 little ones who were much smaller than me yet somehow much stronger than me lol. I finally got everyone dressed and in the car and away from their Easter baskets by convincing them they could have just one piece of candy on the way to church. Steven screamed for me to play “Thunderstruck” by ACDC in the car (his favorite song because he thinks Ironman sings it) and after the 50th screaming request I gave in. We rolled into the church parking lot dressed in our Easter best while “THUNDER” blared very loudly from our big fancy family SUV. We hurried out of the car and into church before anyone could put my face with the car that was blaring heavy metal in the church parking lot with 3 little ones in the back seat. lol. We made it to the line at the nursery check in 15 minutes before service started. 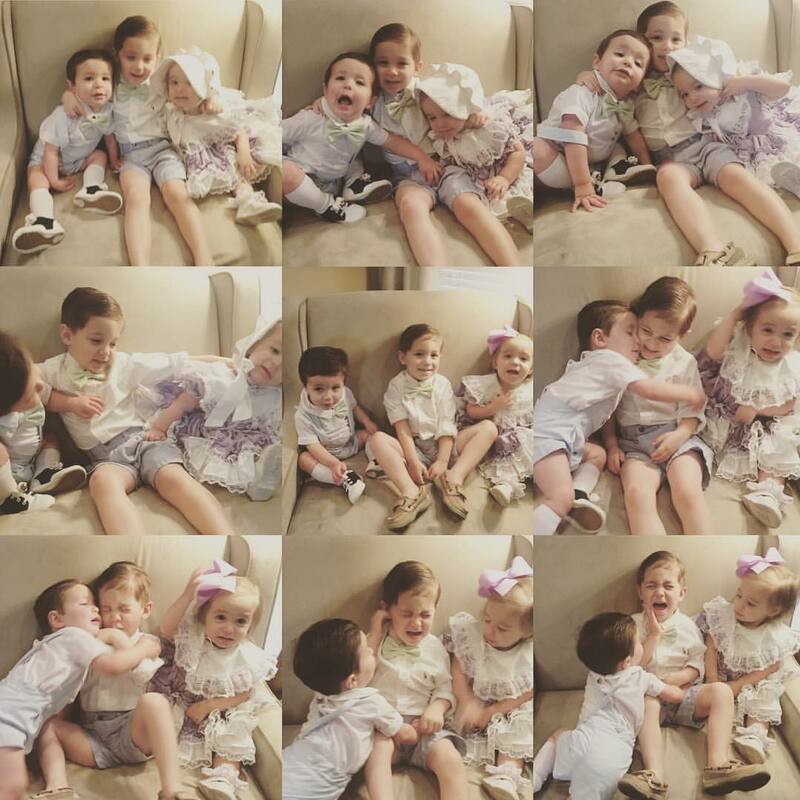 Last Easter, during nursery check in, I had both twins in my arms when Steven lifted my dress up in front of everyone. With my arms filled with kids, I was totally helpless and left me showing everything I had to everyone around me on the most populated day at church all year. When that didn't happen this year I thought things were finally looking up! lol! 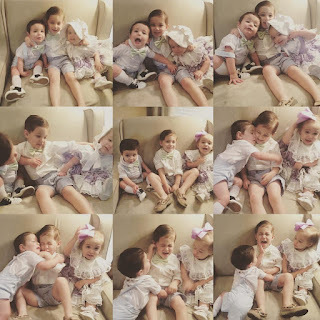 It wasn't until I walked the kids into the nursery I realized Stevens entire rear was covered in yellow marshmallow candy and the twins had chocolate all over them and their fancy expensive Easter outfits, and it looked a whole lot like something else instead of a whole lot of chocolate. I ran out of the nursery before anyone could notice I was the one who had dropped off the dirty kids and joined Mitchell just in time for worship. Worship was amazing and all the troubles of getting the kids to church had been melted away from my memory. We sat down ready to hear the sermon and I realized “ Wow, Mitchell got some great seats right in the front- this is awesome but I sure hope I don't have to get up and go anywhere during the service because Ill have to walk in front of all these people!” - As that thought crossed my mind Mitchell nudged my shoulder and pointed up to the top right of the screen on the stage where I saw Charlottes number flashing. At our church each child has a number and if the nursery cant get your child to calm down they flash your number on the screen as a way for you to come get them. I ALMOST DIED. Here we were sitting right in the front, everyone knows what the flashing number on the screen meant and everyone would know that I was the mother of that flashing number when I got up and walked in front of EVERYONE to make it to the back door to the nursery. Mortified, I walked back to get Charlotte, who was totally loosing it and crying for Candy - yes candy - she was screaming it over and over. I tried to calm her down but when I couldn’t get her quiet, I took a peppermint I found from the lobby and let her eat it. I thought it would calm her down and buy me some time to listen to the service outside the door but she ate it in record time and the started screaming “candy” louder and louder. I gave up, got all the kids out of the nursery early and waited in the lobby with the kids until the service was over. I was SO upset - jealousy flooded by head, my face was burning. I kept thinking “Well Mitchell is inside hearing that wonderful message that I needed to hear SO bad while Im out here burning slap up trying to remember I'm at church and I need to keep my voice down as I threaten the kids lives if they run from me one more time”. When the service ended, I put on my fake smile as friends and family came out of the service. Everyone looked so refreshed - They had all been inside celebrating the most wonderful day of the year. Yep - I was not happy I ended up spending the service I had worked so hard to get to running after 3 kids who were hyped up on sugar and caffeine. We left church and started the journey from one end of the county to the other by visiting our families on each side and spending the rest of the day trying our best to get the kids to nap in the car from one family event to the next. 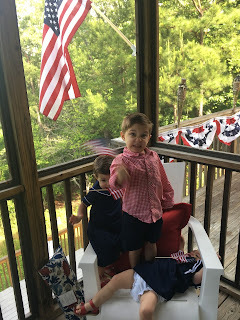 Because my kids are freaks of nature some days, they went the whole day without naps, and when we finally got home at 8:00 that night, they refused to go to bed like I assumed they would easily do! The kids were crying and soon after I was crying too! I wanted to end this day with a feeling of joy, not a feeling of jealousy, anger, frustration and exhaustion. I wanted a blessing from the Lord that day and when we finally got everyone down for bed and I sat down for the first time the whole day, I realized I was not going to get it. Mitchell went on to bed and I stayed in the living room feeling so defeated. I wanted to go to church, serve the Lord with my whole heart and end my Sundays feeling like I had accomplished something for the Lord. Instead I felt like I had been running a rat race the whole day - The devil was still hanging out laughing because he thought he was winning the battle on that Easter Sunday. I stared at the wall and just sat there - totally quiet. When we are quiet we are able to hear our precious Lord speak to us. I felt the lord stir up my spirit and as I began to pray I heard him speak - “Don’t stop”. It was exactly what I needed to hear - Don't stop trying to get everyone ready for church on Sundays - just get them there and Ill do the rest. Don't stop trying to serve me - you are serving me while working hard to keep your family on track. Don't stop fighting for your family, Don't stop playing for your family, Don’t stop trying to hear the word - you can watch that service you missed online right now - and even better - you can watch it your pajamas instead of that dress and that uncomfortable shape wear that was making you sweat more than ever. Just don't stop. Those words made me think back to my childhood . One of the biggest thing I can thank my parents for is making sure when we were growing up we were always at church on Sundays. It didn't matter what had gone on that weekend, how tired we were, what kind of fight we put our parents through, how much we did not want to be there - we were there. Because of that - the seed was planted deep in my heart, my Sunday school teachers, youth pastors, church pastors, church friends and family watered it every Sunday and it helped me become the Believer, Wife and Mother that I am today. All because my mama didn't let all that Saturday night and Sunday morning drama keep us from hearing the word of God on Sundays. Steven is still young but he knows about Jesus and knows that Sundays are the days we spend time at church. When he sees me cleaning and setting out chairs, he always asks me if its time for “Small Group Jesus time” - He may only be 3 but he sees his mama and daddy serving the Lord - something that I hope starts that seed inside of him. Sundays are far from easy- they are the hardest day of the week around my house. But I know its because the devil is working overtime to keep me from getting to church and serving my King. I can look back on my life and remember so many times when it would have been so much easier to not have to mess with church. It was even easier when Mitchell and I just went to church instead of serving. It was when we discovered our purpose the Lord had given us here on this earth and began to pursue it with everything we had that we realized it wouldn't be easy but it would be worth it. Luke 22:27-30 “Who would you rather be: the one who eats the dinner or the one who serves the dinner? You’d rather eat and be served, right? But I’ve taken my place among you as the one who serves. And you’ve stuck with me through thick and thin. Now I confer on you the royal authority my Father conferred on me so you can eat and drink at my table in my kingdom and be strengthened as you take up responsibilities among the congregations of God’s people.” The greatest in God’s sight are those who humbly serve, the ones who face the challenges of the day and keep pursing Him and keep serving Him no matter what. Its the one who keep going and never stops that the Lord sees, not the ones who sit back and say “thats just too hard for me, I’m not dealing with it” Would it be easy for Mitchell and I to just watch church online and avoid the hassle of getting the kids dressed and out the door? Would it be easy for us to stop teaching our small groups, finding a sitter for the kids and getting the house clean in time for company? 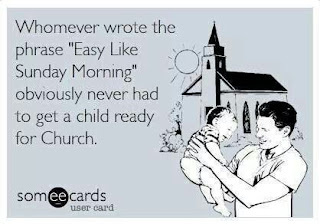 Would it be easier for us to avoid serving at church and raising new leaders up so we could just sit at home and have that “easy like Sunday morning” experience? Yes it probably would - but what do we gain?? Earthly pleasure? Not interested - I’m here to win souls for Christ and fulfill the purpose that the Lord has made me for and to work towards the rewards that I will benefit from in Heaven eternally, not just worldy, short term gain. I always listen to the Commodores sing “Easy” on Sunday mornings as I get dressed or on the way to church so I can always laugh and think about how far from easy it actually is, but I focus on the fact that even if its not easy, just like the Lord told me in my living room that Easter Sunday, I wont stop. Easter didn't go as planned for me and I may not of gotten the blessing I had pictured but I got something much better - that was the understanding that Jesus came and died on the cross not just so I could go to heaven, but so I could have the opportunity to get my family and friends to come to heaven with me. I wont stop taking my kids to church on Sunday and I wont stop serving Him because I want my children to see that no matter how hard things can be - you can always run to Jesus and feel that freedom and that “relaxing, easy Sunday morning feeling” that really only the Lord can truly give us. Mamas, can I encourage you to fight through that Sunday morning and get your family to church. It is all worth it when you see your child engaging in the children church lesson, hearing them say sweet prayers, being able to understand exactly who Jesus is and accepting them into their heart. I can promise you that all that drama of getting them dressed for church, struggling to get them in the car and how they acted that morning is nothing to the feeling of seeing your child begin a relationship with Jesus. And because you “didn't stop” your children will be in heaven with you one day. They will tell others about Jesus and then those people will be in heaven and it goes on and on. Its easy to feel like you are not “serving” God in the way that you would like in this season of life but remember Hebrews 6:10 “For God is not unjust so as to overlook your work and the love that you have shown for his name in serving the saints, as you still do.” The Lord sees us working even when we think no one sees and by getting our family to church so they can hear the word and feel His spirit, we are truly serving God. We will get that “easy like Sunday morning” feeling one day when we are in heaven, relaxing and rejoicing that we are with our family and our Lord and Savior. Don’t let the devil continue to camp out at your house on Saturday nights and Sunday mornings - remind him who always wins and no matter what - DON’T STOP!